“When America sneezes, the rest of the world catches a cold.” This cliché is often cited to explain how economies around the world react to events in the United States. As you might expect, there’s a kernel of truth hiding behind the cliché, and part of the explanation has to do with the relative size of the American economy compared to the rest of the world. Take a look at our new map to see what we mean. 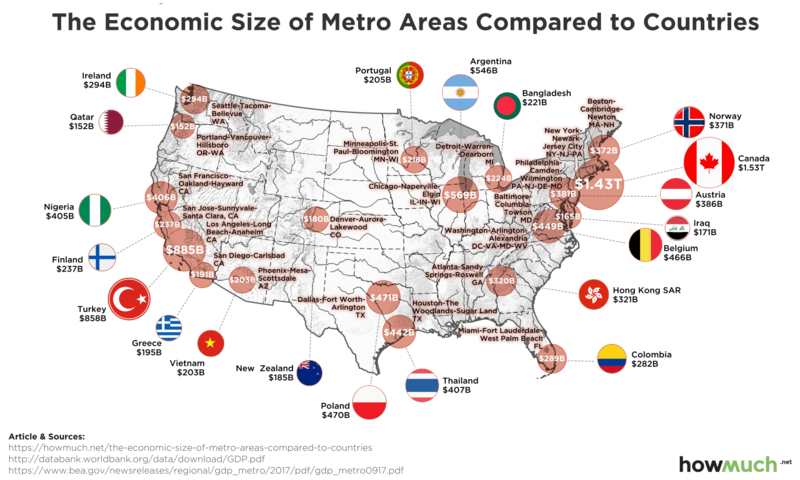 Our viz takes data from the Bureau of Economic Analysis and maps the size of various metro economies (in millions USD). The larger the circle, the larger the economic output of that area. We then compared these numbers to GDP figures from the World Bank, placing the corresponding country’s flag next to the U.S. metro area closest in size. Arranging these two datasets on the same map helps you understand how enormous the U.S. economy is compared to the rest of the world. The economic output of the New York metro area is almost as significant as the entire country of Canada. California alone sees more economic activity than Turkey, Finland, Nigeria and Greece—combined. You could fit the entire Argentinian economy inside the greater Chicago area. Obviously, the American economy packs a powerful punch. It’s important to keep in mind what these numbers represent. Gross Domestic Product (GDP) is an economic measurement derived from adding together every exchange of goods and services in the economy. It boils an ocean of economic activity down to one understandable number. That being said, GDP is not the best measurement for comparing the relative standard of living between countries. For example, Nigeria has an economy roughly equivalent in size to San Francisco, but the former is mostly concentrated in oil wealth and plagued by corruption. Last year, the Economist estimated Nigeria’s economy would be $20 billion larger without so much corruption. I think we can all agree that Finland, with an economy that’s slightly more than half the size of Nigeria’s, is certainly a more comfortable place to live. Here’s a list of the top ten largest metro area economies in the U.S. together with their international counterparts (with GDP listed in USD millions). It’s pretty amazing to consider how an entire country’s economic output can be matched by a single metro area in the United States. The U.S. still has the largest economy in the world (for now). That is worth keeping in mind when you hear about economic growth in other countries—they still have a long way to go to match the size and strength of the United States.